Yet another black box for your living room? Yes and no, this little beauty is Belkin’s new wireless transmitter and receiver, aka FlyWire. FlyWire can connect to all your devices without the need to install wiring, so no more climbing up ladders and ripping out bits of your house in an effort to connect everything up without seeing wires all over the place. The new wireless transmitter can send 1080p video over a 5GHz band, and it is not all beauty and no brains, to make sure there is no interference it intelligently adjusts the frequency and power. Read on for more details. Belkin offer a basic remote control for switching between the different inputs, and good news for everyone using a universal remote control, it works over IR. FireWire will come in two flavours: FlyWire AV69003 and FlyWire R1 AV69000. 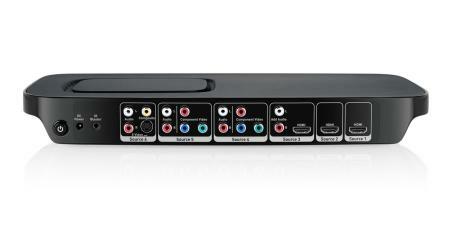 FlyWire AV69003 will be priced at $999.99 and is intended as a whole home solution. 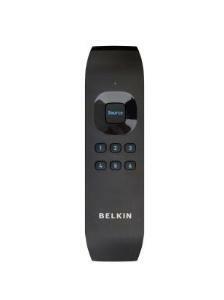 You will be able to have your devices anywhere in the house and be able to control them all through the Belkin FlyWire. The control of the devices will be done in one of two ways, either IR backchannel or through IR receiver and IR blaster attachments. Either way you will be able to hide your AV devices away in other rooms or cupboards and keep your living room nice and clutter free. FlyWire AV69003 will hit the stores late October 2008. FlyWire R1 AV690000 will be priced at $699.99 and is meant for one room only so you don’t get the cool IR backchannel or the IR blaster attachment. This one seems slightly pointless to me as, yes you are reducing the number of wires but you still have to have the AV devices on show to be able to control them… Anyway, this version will be available around the first quarter of 2009. As for connections, both versions will have three types of input: 3 HDMI, 2 component, and 1 composite. As it would be a little useless without an output it also has 1 HDMI. For more detailed spec check out Business Wire.